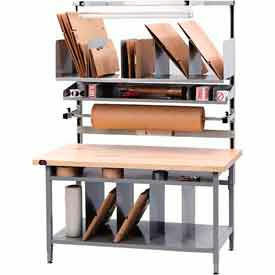 Heavy Duty Stationary Packaging Workbench Is Used For Mailrooms, Small Businesses, Gift Wrapping Stations And Storage Of Packaging Supplies. 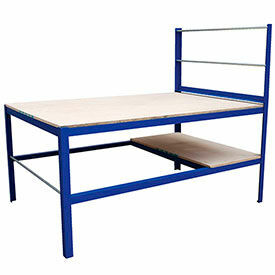 Heavy Duty Stationary Packaging Workbench is made of 14 gauge tubular steel for long lasting durability and strength. Workstation features 2" square height adjustable legs from 28 to 34" high at 2" increments. 5000 lb. capacity provides strong, sturdy work surface. Adjustable leveling floor glides and leveling foot plates allow floor anchoring for better stability. 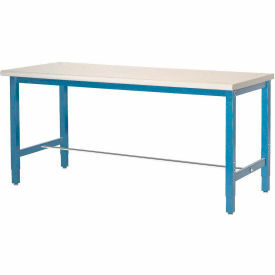 Bench top types are Butcher Block, ESD, and Plastic Laminate which are available with Square Edge or Radius Safety Edge. Color is Blue. Dimensions vary per model. Large 72"L x 30"W x 1-5/8" thick plastic laminate surface. Lower shelf is 60"L x 24"W and provides additional storage space. Riser kit includes two 60"W riser shelves; (1)14"D and (1)18"D. Also includes 8"H adjustable dividers to create organized storage on riser shelf. Finished in brilliant chrome for a tough but good looking appearance. 72"L x 32"W x 74"H overall. Optional Tape/Roll Dispenser allows multiple rolls of tape to be mounted at the back of the work surface or for a roll of paper to be suspended close at hand beneath the work surface. Easy Assembly. Multi-Purpose Packaging Workbench Provides a Convenient Work Surface For Assembly Lines, Packaging Areas, Warehouses, and more. This multi-purpose packaging workbench is designed as a large, easily accessible work area for the preparation, wrapping, and packaging of various content and materials. The hardboard square edge surface is useful for handling both fragile and durable items making it an optimal work surface for any application. The workbench has an elevated tower for storing and dispensing packaging paper, stretch wrap, and bubble wrap with a third reel under the bench for extra material storage. The lower shelf is designed as out of the way storage for boxes, tape, tools, and other materials. The steel frame construction provides strength and reliability for heavy duty working conditions. The bench holds rolls up to 44"W and 20" diameter. The color finish is Blue. The dimensions are 72"L x 48"W x 34"H.
Pro-Line Complete Packaging Workbenches are used in Packaging Applications for Shipping, Warehouse, Assembly Line, and more. The two Pro-Line series available are the Complete Packaging Bench (CBD) Series that have welded tubular legs, or the Packing Tables (IWB) that have open channeled bolt-together legs. These Pro-line complete packaging workbenches are designed to store and organize your packaging equipment and materials for ready to use access. The full width storage shelf under the countertop has a 4"H clearance for small tool and supply storage. 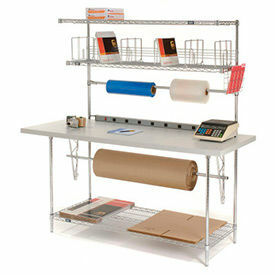 The lower shelf includes dividers for storing boxes, cartons, large envelopes, and other items. The bench legs are height adjustable to support multiuser working heights. The upright kit allows easy installation and height adjustment of overhead storage accessories. The steel frame construction is both strong and sturdy for years of dependable service. Includes adjustable leveling feet for support over uneven surfaces. Top construction options are ESD Square Edge, Maple Butcher Block Square Edge, Particle Board Safety Edge, and Plastic Laminate Square Edge. Available widths are 60" and 72". Adjustable bench height ranges include 30"-36" and 42"-48". Ground kits are included with only ESD bench top models. Available color finishes are maple, natural, and white. 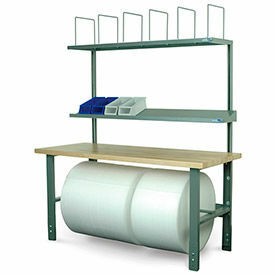 Stackbin Adjustable-Height Packing Bench With Plastic Laminate Top - 72X30"
All-in-one unit stores everything you need to package and ship items. Includes 12"D slanted cantilever storage shelf that offers easier access to supplies. 12"D overhead shelf with 6 adjustable plastic dividers and packaging material roll holder. 1-3/4" thick bench top. Adjustable-height legs. 14-16-gauge steel components. Order roller bearing drawer separately.